Three months ago Jose Martinez set out to prove that Kia’s Stinger GT was the ultimate grand touring car. He put the sports sedan through the paces on some of the country’s most beautiful and unforgiving road, darting through snowy mountain passes and down winding routes with his performance-engineered KEENDESIGN wheels. But that was only just the beginning. Jose Martinez is back, and this time, he has even tougher roads in mind. 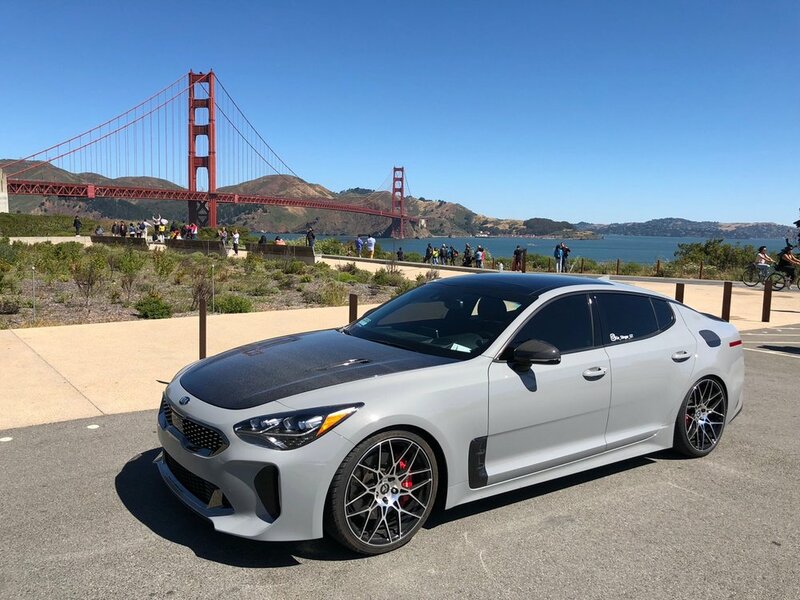 His Kia Stinger GT and 20” KEENDESIGN KD07 forged wheels had made his previous cross-country road trip effortless, but how will they hold up on the precarious inclines of San Francisco’s infamous streets? (Haven’t read about Jose’s cross-country roadtrip yet? You can read about it here). After a quick mid-morning gas fill up at a local southern California gas station, Jose began his trek to northern California, the Machined Black finish of his KEENDESIGN KD07 wheels glistening in the spring sunshine. After a long, linear journey down the I-5 North dodging potholes and rock chips, Jose arrived at his first official destination-the tucked away, “Fog City” that is San Francisco. Stopping at the famed “Russian Hill” in downtown San Francisco, Jose caught this magnificent shot of his Kia Stinger perched high on the hill, looming miles above the city. Jose continued this stop-go pattern throughout the next few days, visiting other historical landmarks such as the Golden Gate Bridge and San Francisco’s magnificent, Victorian-era architectural monument of the Painted Ladies. This constant stop-go movement did not seem to affect Jose’s Stinger GT, as his KEENDESIGN KD07 wheels were specially engineered to provide optimum performance in any conditions and under any circumstances-even in the heavy traffic of San Francisco's congested streets. The multi-spoke, forged design of these KD07 wheels allow for optimum air flow to the Stinger’s rotors and calipers, which insures that the vehicle's braking system remains cool and provides optimum performance, especially when on San Francisco’s unrelentingly steep roads! After an enjoyable few days of sightseeing, Jose began his long journey back to Southern California, his KD07 wheels not once compromising his ride quality or comfort on the long excursion back home. A few gas fill ups later and Jose had arrived back in sunny southern California, the dazzling coastline he calls home once again in view. Neatly tucked away in his garage, Jose’s Kia Stinger GT with its KEENDESIGN KD07 wheels awaits its next opportunity to push the limits of what it means to be a Grand Touring car, and to prove the strength and durability not only of Korean engineering, but of his highly durable, precision-engineered KEENDESIGN wheels.